In 1895 the Italian physicist and later Nobel Prize winner Guglielmo Marconi (1874-1937) had realised wireless telegraphy, i.e. the possibility of transmitting information with the help of radio waves. The communication across the Atlantic did not function well during World War I and the need of telegram traffic with America was great. The Swedish Parliament therefore decided in 1920 that a Swedish long wave transmitting station and a receiving station should be built under the direction of the “Telegrafverket”. Important for the location of the establishment was that the wave propagation path was run across open waters – south of Norway and north of Denmark and Scotland. In Grimeton, east of Varberg, the open landscape gave free way for the radio waves out towards the Western Sea and besides, the name was easy to pronounce for Americans. 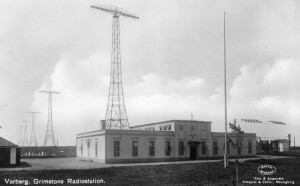 The Great Radio Station was built during the years 1922-1924. In the autumn of 19 23 the establishment was ready except for the six 127 meters high antenna towers, which were delayed one year because of strikes at the ironworks. The towers are placed at intervals of 380 meters with the 46 meters long cross-arms on top carrying the eight copper wires, which make up antenna capacitance and feed energy to the six vertical radiating elements. A little village with dwelling houses for seven families was built for the employees. On December 1, 1924, the great radio station Grimeton went into traffic with the call signal SAQ on 16.1 kHz (wavelength 18.6 kilometres) soon enough changed to 17.2 kHz (wavelength 17.4 kilometres). On July 2, 1925, the establishment was formally inaugurated. King Gustaf V arrived by car from the Varberg railway station in company with among others the constructor Ernst Alexanderson. During the station’s now more than 80 years of history much has happened. 1938 short-wave tests were made. World War II accelerated the development and the number of short-wave transmitters increased rapidly and there are still some twenty transmitters at work. FM- and TV-transmitters were placed here and base stations for different mobile services were also established gradually.